If you’ve ever built anything from the ground up with HTML/CSS you know the issue: <div> only expands vertically to fit its contents. Put some of those <div> tags side by side to make columns and chances are, they’ll end up hanging awkwardly above where you want them to be. 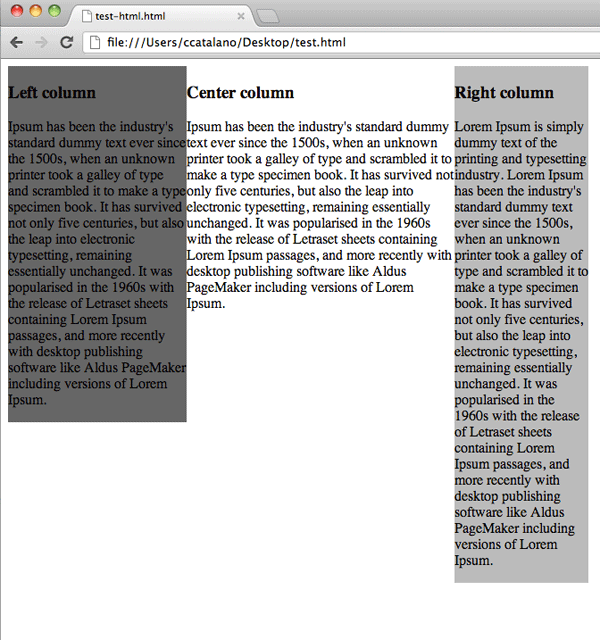 The cannonical fix is the Faux Column, a slender, repeating image in the background behind the columns, colored to match the <div> elements that don’t quite make it to the bottom of the screen. The uneven columns problem. Honk if you’ve dealt with this. While this works well enough, I’m decidedly against using image kludges (don’t get me started on font image replacement…), and I resent having to make the round-trip through Photoshop every time I want to resize, when effects as complex as box-shadow and animations can be dictated cleanly and semantically with stylesheets. kind of structure for divs, where it automatically adapts to the height of the parent element, whether that’s another div, a table, or just plain . That way you can just encapsulate them in a shared div.